In visiting a labyrinth of malls in Flushing, Queens New York City’s largest Chinatown we find various dresses imitating Dolce’s Sicilian-homemaker after-midnight attitude as well as knockoffs of its signature logo. This just two months after remarks about Chinese culture were posted on social media by designer Stefano Gabbana that many Chinese found insulting and forced the abrupt cancellation of the brand’s fashion show planned in Shanghai. In the time since, blue-chip Chinese retailer Lane Crawford has dropped the label, while numerous high-profile Chinese celebrities have pledged to never again purchase or promote the brand. Despite the hubbub, Flushing’s hawkers said they were unaware of Dolce’s maligned status in China. 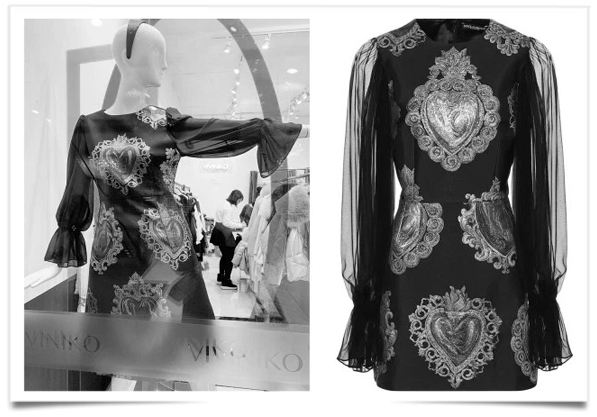 One dress for sale at the New World Mall, fashioned from a gilded heart jacquard is nearly identical to one on sale with My Theresa for $1,533. This entry was posted in BREAKING MODE, BREAKING NEWS and tagged DOLCE & GABBANA by admin. Bookmark the permalink.